Talent often lies latent, undiscovered hiding in obscurity due to nothing more than a lack of exposure. Presence is everything and with prominence comes many social connections, business associations, and profitable partnerships. Finding a literary agent who is interested in your manuscript grants you all the insight, expertise, and social connections needed to boost your book to publication. One had need just look at authors such as J.K. Rowling to see the importance of getting noticed by a good literary agent. Once your success scales to such a magnitude, the help is invaluable. Yet any good writer who is still to debut the publishing scene will find a literary agent’s services just as invaluable. To help you find the best match to your writing, here is an overview of 21 UK literary agents accepting submissions via email. The Blair Partnership is a prominent UK literary agency who has been involved in the representation behind the Harry Potter series of books. Situated upon Vine Hill in London, The Blair Partnership is always seeking new creative talent across the avenues of fiction and young adult fiction. Their illustrious client portfolio includes Zoe Adjonyoh, Ghanian chef and author, Hassan Akkad, filmmaker and winner of the BBC2 documentary entitled “Exodus: Our Journey to Europe”, and the eight-year-old Syrian girl Bana Alabed who become world-renowned for her 2017 story “Dear World” published by Simon and Schuster. With these and J.K. Rowling being just a few of their world-famous talent, one would do well to be represented by The Blair Partnership. A range of agents are available to assess your work. Be sure to approach a suitable agent with a coverage in your style or genre. Full details regarding their submission process can be found on The Blair Partnership ‘Contact’ page. Founded in 2008 by David H Headley, DHH Literary is an agency which carries a range of experienced agents. Submissions should be made to a specific agent, after gauging their specialization available at this page. In-house editorial, television, bookselling and collecting agents are readily available to help your creative process towards reaching acclaim. Helping both established writers and debut authors, DHH Literary represents a range of novelists, short-story writers and children’s authors. They have lead many fantastic authors towards success. A prime example of their published talent is Abi Elphinstone with her series “The Unmapped Chronicles”, a story of mysticism and magic set in the heart of adventure. You can find full details of their electronic submission process on the DHH Literary Agency ‘Submissions Page’. If you’re looking for a UK children’s literary agency that accepts submissions via email, Miles Stott could be the organisation for you. Miles Stott Children’s Literary agency was founded in 2003 by Nancy Miles, Victoria Birkett and Mandy Suhr and is based in Pembrokeshire. It represents award-winning authors and illustrators. The agency works with debut authors and illustrators and also those who are midway through their careers. Miles Stott Children’s Literary Agency represents nonfiction books, picture books, board books, novelty books, young fiction, middle grade fiction and YA fiction. It doesn’t represent educational books, musical books or poetry. If you’re interested in making a submission to Miles Stott, ensure your book is first class, as this agency receives many submissions on a daily basis, and follow the instructions carefully at its submissions page. Aitken Alexander Associates was established in 1976 and holds offices in both London and New York. They are a large, well-established literary agency who supplies expert editorial advice, as well as profound skills in the negotiation of terms and contracts. Their star-studded array of authors include Douglas K Murray who recently signed a deal with Bloomsbury Books for his exploration of modern taboos “The Strange Death of Europe”, and Mark Lowery with his delightful discourse on empathy “Charlie and Me – 421 Miles From Home”. Aitken Alexander Associates are always seeking new talent, despite their huge roster of published clients. You can find full details of their requirements and process on the Aitken Alexander Associates ‘Contact Us’ page. Headquartered in London, Jonson & Alcock Literary Agency represent both fiction and non-fiction authors and are accepting of both print and email submissions. Founded in 1956, they represent a broad range of vibrant bestselling authors. Five agents are available to assess your ability. It is best to evaluate their individual style and specialization before submitting your work. They boast a steady selection of debut authors including such works as “Close to Home”, the gripping eight-book tale of an eight-year-old gone missing by Cara Hunter. Another great recent success was the Hamish Hamilton acquisition of debut novel “Supper Club” written by Lara Williams. You can find complete details covering their submissions process on the Johnson & Alcock Literary Agency “Submissions Page”. Janklow & Nesbit is a large, prominent, powerful literary agency with offices in London and New York. Exhibiting a diverse range of clients including Michael Crichton, Anne Rice, Danielle Steel, Tom Wolfe, and Jeffrey Eugenides to name just a few, the representation, should you be selected, is nothing short of outstanding. They have even been responsible for the promotion of notable US politicians including Jimmy Carter, Richard Nixon, and Senator John Kerry. No matter which genre you look at, Janklow & Nesbit excel. They even have backed non-fiction authors such as Gore Vidal and David McCullough. Their London agency opened its doors in 2010, however Janklow & Nesbit has been in operation since 1973. You can find full details of their submission process on the Janklow & Nesbit UK ‘Submissions’ page. Established in 2002 by Linsey Fraser and Kathryn Ross, leaders of the Scottish Book Trust for over ten years, Fraser Ross Associates are well-established literary agents based in the UK. Carrying illustrious representation achievements such as talent including renowned authors such as Sorrel Anderson, Gill Arburthnott & Tim Archbold, Fraser Ross Associates are leading agents with a UK and international presence. Their team of professionals have worked side-by-side with the BBC to launch the “Blue Peter Book Awards”, as well as having served on the Nestle Smarties, Whitbread and Fidler judging panels. Submissions of novels, non-fiction and picture books are accepted digitally. You can find full details of their submission process and requirements on the Fraser Ross Associates ‘Submission Page’. Lucas Alexander Whitley, or LAW, is a literary agency situated in London who actively promote authors from the United Kingdom. Even though film and television scripts are handled for established clients, LAW does not accept submissions from abroad, nor do they do poetry and textbooks. They boast an astonishing array of leading fiction and non-fiction writers, as well as high-profile public speakers to assist in the promotion of your book. There are no less than eight talented agents at your disposal with passions bridging every area of publishing. They have worked with major names in publishing including Penguin Children’s Books and HarperCollins. If you are a UK author seeking an agent, view the Lucas Alexander Whitley ‘Submissions’ page for full details of their process. Eve White Literary Agency represents authors who produce adult and children’s fiction, as well as non-fiction. Eve White is a seasoned author who was shortlisted for both the BIA 2015 Literary Agent of the Year award, and the British Book Awards in 2017’s agent of the year prize. This agency features a surprisingly quick submission reply time of under a week on average and they are always welcoming of new clients across a variety of genres. As a proud member of the Association of Authors, Eve White Literary Agency proudly represents rapidly rising talent such as Andy Stanton, Sarah Coyle, and Tracey Corderoy. Full details of their submission process, free from a reading fee, is supplied on the Eve White Literary Agency ‘Submissions Page’. Founded in 2012, Madeleine Milburn Literary Agency have established themselves as one of the UK’s top literary agencies. Situated in Mayfair, London, they boast an astonishing array of talent across many genres in English literature. Since its inception, Madeleine Milburn, a St. Andrews Literature and Language graduate, has helped many new authors reach fame thanks to the many print and film partnerships the agency holds. With powerhouse authors such as Holly Bourne receiving screen rights for her adult novel “How Do You Like Me Now?”, the close collaboration with associations including the Creative Artists Agency in Los Angeles has proven invaluable to upcoming talent. Email submissions are accepted with full details of the submission process being available on the Madeleine Milburn Literary Agency ‘Submissions Page’. Founded in 1977 by American born Andrew Lownie, the Andrew Lownie Literary Agency is backed by a bookseller and journalist who has worked with many prominent publications. This includes journalistic contact with The Times, The Spectator and The Guardian. Aided by the commercial and literary fiction expert David Haviland who has worked with publishers such as HarperCollins, Penguin, Brown, and Piatkus and Little, this agency covers a broad range of genres. To get a better idea of their preferred style, one had need just look at the current submissions to active publishers. Book rights to “Louis XIC: The Gift of God” by Josephine Wilkinson and “Princess: The Early Life of Queen Elizabeth II” by Jane Dismore, give a good gauge to what they find works in the UK. Full details of their submission process are found on the Andrew Lownie Literary Agency ‘How to Submit’ page. Headed up by ex-President and Vice Chair of Penguin Canada and CEO of Penguin Books India, Mike Bryan, HMA Literary Agency is a well renowned agency working in close partnership with their writers. They supply insights, editorial support and advice to help shape proposals and fine-tune manuscripts. HMA Literary Agency accepts submissions from authors based in the UK, India and Canada. International authors are considered, however these countries are preferred. Their range of profound authors include MJ Akbar, published by HarperCollins, and 2014’s Gemmel & Goodreads Awards for Best Fantasy shortlisted candidate Sebastien de Castell with his brilliant “Saint’s Blood”. Full details regarding their submission process can be found on the HMA Literary Agency ‘Submissions’ page. Established in 2012, Diamond Kahn & Woods Literary Agency is a team of three renowned publishing agents holding international acclaim. From their North London headquarters they have helped numerous stars rise to fame in both publishing, film and television. Numerous awards are held by the talented agents at Diamond Kahn & Woods Literary Agency. Ella Diamond Kahn, founder and literary agent, holds a specialization in children’s fiction, upmarket contemporary novels, historical fiction, a selected range of non-fiction, and science fiction. Bryony Woods is a publishing graduate from the University College of London who focuses on quirky children’s fiction, young adult and adult fiction, and non-fiction. Elinor Cooper is the third literary agent at DKW Literary. She has worked closely with countless authors and illustrators since her degree in English & American Literature from the University of Manchester. Ella and Bryony received the Rising Stars of 2013 Award by ‘The Bookseller’, and won the London Book Fair Trailblazer Awards of 2016, and the Young Stationers’ Prize 2016. They are always looking for new talent. Full details of the submission process can be found on the Diamond Kahn & Woods Literary Agency ‘Submissions’ page. Lutyens & Rubinstein Literary Agency is a UK-based agency which prides itself on collaborative promotion of new and established authors. While not accepting of film scripts or plays, Lutyens & Rubinstein are always seeking new talent. Backed by seasoned agents Jane Finigan, Daisy Parente, Juliet Mahony, Francesca Davies, and Susannah Godman, their portfolio spans a broad range. From fiction to non-fiction, children’s content, young adult fiction, illustrated books and cookery, the agency’s client list includes numerous award winners. With their own independent bookshop in Notting Hill, Lutyens & Rubinstein are well known for their promotion of bestsellers to both a local and international market. You can find full details of their submission process on the Lutyens & Rubinstein Literary Agency ‘Submissions’ page. Representing writers for all forms of media, The Viney Shaw Agency is always looks for new talent. The only manuscripts which are not open to consideration are play and film scripts. Headed up by Charlie Viney, literary agent since 2002, and Kate Shaw who has worked with some of the UK’s bestselling authors such as Holly Smale of “Geek Girl”, this is an agency which works closely with their clients. With industry experience in close association with Penguin Books, The Golden Egg Academy for children’s writers and numerous other prominent publishers, The Viney Shaw Agency is welcoming of electronic submissions. You can find the full details of their submission requirements and process on The Viney Shaw Agency ‘Submissions’ page. The Caroline Sheldon Literary Agency boasts a successful range of authors and illustrators across all genres of fiction and children’s books. The agency was founded over thirty years ago by Caroline Sheldon, a prominent publisher of women’s and children’s books. You also have the skills and experience of Felicity Trew, premier literary agent, and Georgia Holmes who runs administration at your disposal. Between them the agency has contacts in film, television, translation and merchandising. As a proud member of the Association of Author’s Agents, the Caroline Sheldon Literary Agency is open to submissions from new and existing authors. Full details are available on their ‘Submissions’ page, with many handy tips and keen insight available to help kick-start the promotion of your manuscript. The Ampersand Agency Ltd is a literary agency established by the once-youngest member of the editorial board of Penguin Books. Headquartered in Oxfordshire and a proud member of the Association of Author’s Agents, there are no less than four specialized literary agents available to assist you, should your work be considered by the agency. They have worked with talent such as John Travolta, Muhammad Ali, David Gemmel, PD James, and Nate Crowley. From crime thrillers to non-fiction, science fiction, contemporary and adult novels, and even children’s books, the representation of this agency is outstanding. They are open to unsolicited manuscript submissions via email and are not open to TV and film projects. You can find full details regarding the submission process on the ‘Submissions’ page of The Ampersand Agency site. Diane Banks Associates is a literary agency registered in England and South Wales and representative of publications to a global audience. They cover a broad range of talent spanning almost all genres of fiction and non-fiction. They have represented authors of autobiographies, novels concerning pop culture, health and lifestyle books, discourses concerning science and psychology, publications on history and current affairs, business books, memoirs, narratives, women’s fiction, upmarket fiction, crime, thrillers, science fiction, fantasy, young adult novels, children’s books and a range of other subjects. A team of five talented agents make up Diane Banks and Associates. You can find full details regarding their requirements, expectations and submission process on the Diane Banks and Associates ‘Contact & Submissions’ page. Bell Lomax Moreton was established in 2000 and has since expanded to exhibit a wide range of talented, prominent authors and illustrators. Their portfolio includes numerous forms of fiction, non-fiction, and children’s books. The only manuscripts which they don’t represent are poetry, short stories, novellas, educational textbooks, film scripts, stage plays, and science fiction. Their publication of young adult fiction and children’s illustrated books is the most prominent from their portfolio. If you are a writer or illustrator looking to find representation, you can find full details of their preferences and process on the Bell Lomax Moreton ‘Submissions’ page. Felicity Bryan Associates Literary Agency was founded in 1988 and has an illustrious client list of over two-hundred published authors. Between their four full-time agents and one associate agent, they promote everything from adult and children’s fiction across all genres, and non-fiction. While actively accepting submissions for adult and non-fiction, they don’t take science fiction, horror, adult fantasy, light romance, self-help, gardening, film and television scripts, plays or any form of illustrated books or poetry. You can find the full details of their submission process on the Felicity Bryan Associates Literary Agency ‘Submissions’ page. As a proud, top UK literary agency, Kate Hordern Literary Agency only accepts submissions from authors residing in the United Kingdom. They have been exhibiting great success in the promotion of new talent ever since the agency’s founding in 1999. The founding agents include Kylie Fitzpatrick with a focus on historical fiction, Will Randal who specializes in humorous narrative travel books, Richard Basset covering history, and Jeff Dawson with his talent lying in football writing and narrative history. Roughly ten new clients are taken on each year, with full details of their submission process available on the Kate Hordern Literary Agency ‘Submissions’ page. Before rushing off to submit your proposal and the first few chapters of your manuscript, be sure to find the best match to your genre, writing style, and audience. Literary agents will only take in interest in their areas of specialization. When devising your pitch, be sure to address previous success stories of your prospective agent, in comparison to your own work. Highlight how your writing brings innovation, and the areas of similarity where strength of promotion can be found. The key is getting noticed. Do you know any other UK literary agents looking for new writers? Please tell us about them in the comments box below! If you’re looking to make a submission directly to a publishing house without a literary agent, be sure to read our post about 21 UK publishers accepting unsolicited manuscripts. 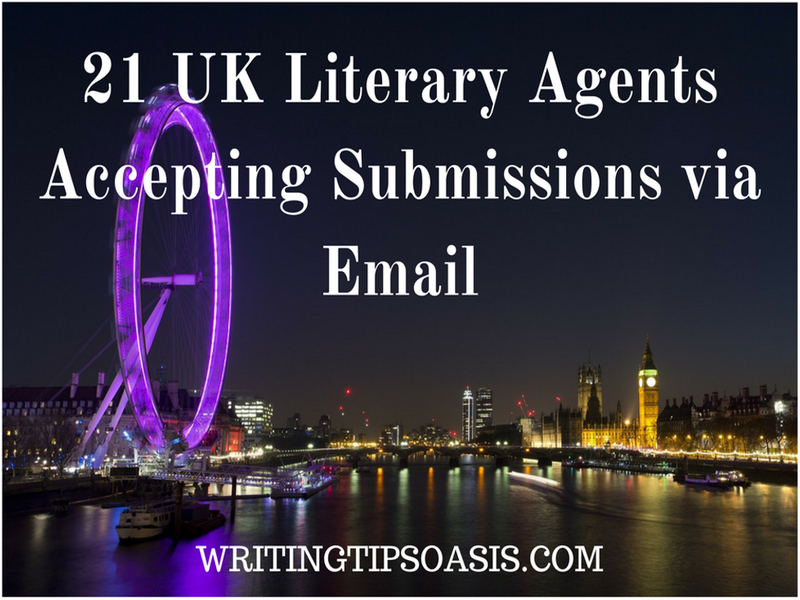 21 UK Literary Agents Accepting Submissions via Email is an article from Writing Tips Oasis. The above comes directly from the Caroline Davidson site. Perhaps you could amend your well-researched list re. 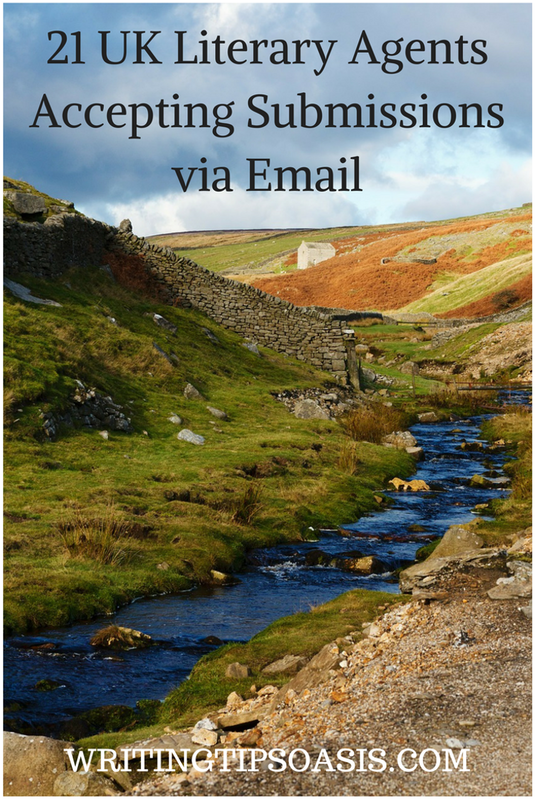 literary agents accepting submissions via email.